Jemaah Islamiyah's engagement in politics is a cynical short-term tactic in its long-term strategy to eradicate democracy. Founder Abu Bakar Ba'asyir has said, "The democratic system is not the Islamic way. It is forbidden. Democracy is based on people, but the state must be based on God's law—I call it Allahcracy." Jemaah Islamiyah sought advantage from the collapse of Suharto's authoritarian rule and Indonesia's descent into a chaotic decentralized democracy. Beginning in 1998, Jemaah Islamiyah launched the "uhud project," whose goal was ridding regions of the country of both Christians and Hindus in order to establish pure Muslim enclaves, governed by Shari‘a (Islamic law). Its two paramilitaries, Laskar Mujahidin in the Moluccas and Laskar Jundullah in Central Sulawesi, engaged in sectarian bloodletting against Christians and Hindus until, in 2002, the government was able to broker the Malino accords, enabling a fragile truce. Meanwhile, Jemaah Islamiyah began a bombing campaign in 2000, killing several hundred people, including 202 in one attack in October 2002 at a Bali disco. With the exception of Ali Ghufreon (known also as Mukhlas), awaiting execution for his role in the 2002 Bali bombing, Southeast Asian jihadists have no important homegrown theoreticians. Jemaah Islamiyah has filled the gap by drawing upon the works of Al-Qaeda's three most important thinkers—Abu Musab as-Suri, whose main work is the 2002 tract "Call to Worldwide Islamic Resistance"; Abu Bakr Naji, who wrote the 2004 document "The Management of Savagery"; and Abdul Qadir (Dr. Fadl), who, in November 2007, penned "Rationalizing Jihad in Egypt and the World." Jemaah Islamiyah has adopted a Hezbollah model of social organization in which most of the group's activities are overt charitable work and provision of social services even as a component of the organization clandestinely pursues terrorism. Beginning in the 1980s, Hezbollah, a Lebanese Shi‘i political group founded by Iran in the wake of the Israeli invasion of Lebanon, began to construct a large network of educational institutions and social services both to complement their military wing and to serve as a recruitment tool. Slowly, Hezbollah built a state within a state in Lebanon, preventing anyone within its territory the option of remaining outside the group's influence. Even as Hezbollah conducts terrorist activities against Israel and within Lebanon itself, many in the international community refuse to define the group as a terrorist organization, in effect arguing that social work is exculpatory. Jemaah Islamiyah's engagement in the political process is a cynical short-term tactic in its longer-term strategy to eradicate democracy. "The democratic system is not the Islamic way," Ba'asyir explained. "It is forbidden. Democracy is based on people, but the state must be based on God's law—I call it Allahcracy." "Islam's victory can only come though da'wa and jihad, not elections." Many of Jemaah Islamiyah leaders hold concurrent positions in Majelis Mujahidin Indonesia, giving themselves a patina of legitimacy and political cover. 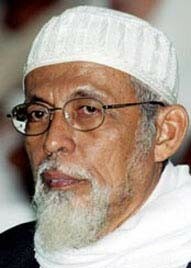 Since his release from prison in October 2004, Abdurrahman (Abu Jibril), for example, has used Majelis Mujahidin Indonesia as his base of operations. But his message has not necessarily changed. In one recruiting film produced by Majelis Mujahidin Indonesia, Abdurrahman calls on his congregants to wage a violent jihad. Armed with a pistol extended into the air he exclaimed, "You can't just have the Qur'an without the steel. You will bring down the steel." His younger brother remains Majelis Mujahidin Indonesia's director of daily operations. Paranoia about Western influence has become a prime motivator for Islamist groups in the Middle East. Prior to the rise of Al-Qaeda, for example, Saudi clergy preached that the Muslim world was subject to a Western "cultural attack" and "intellectual attack." In 1981, the World Muslim League, a Saudi NGO, published a book entitled, The Means of Combating the Intellectual Attack on the Muslim World, which highlighted a theme developed by ‘Abdullah ‘Azzam, a professor at King ‘Abd al-‘Aziz University in Jeddah and mentor to Osama bin Laden. Defense against a "cultural NATO" is a theme that Iranian hardliners have also recently adapted. Hence, almost two years after the tsunami, Ba'asyir declared that "naked women are more dangerous than bombs" in his salvo about spiritual pollution and Western culture and values degrading Islam from within. We therefore call on the international community to demand that the FPI [Front Pembela Islam] and Majelis Mujahidin Indonesia leave Acheh … The FPI and Majelis Mujahidin Indonesia are not welcome in Acheh and have never been supported by the Achenese people, nor has their presence been requested. The FPI has been involved in sectarian killings in Maluku and Central Sulawesi and illegal attacks against non-Muslims and others in Java and elsewhere. Their intervention in Aceh is therefore counterproductive. The Hezbollah model is not new to terrorist organizations, but it is new to Jemaah Islamiyah. Jemaah Islamiyah has taken advantage of an opening: Political will in Indonesia to dismantle terrorist infrastructure has waned as the nature of the group's militancy has become apparent. Released from prison, the group's leaders have been able to focus on political, religious, and charitable work. The civilian infrastructure they have developed will make the group—still committed to terrorism—more durable over the long term. Author interview with Majelis Mujahidin Indonesia officials, Yogyakarta, June 12-13, 2002; Korgres Mujahidini Dan Penegakan Syari'ah Islam (Yogyakarta: Widah Press, 2001); "Should Not Fear Being Called ‘Radical,'" Farish Noor interview with Abu Bakar Ba'asyir, Al-Jazeera television (Doha), Aug. 21, 2006. Ba'asyir, "Should Not Fear Being Called ‘Radical.'" Related Topics: Radical Islam, Southeast Asia, Terrorism | Winter 2009 MEQ receive the latest by email: subscribe to the free mef mailing list This text may be reposted or forwarded so long as it is presented as an integral whole with complete and accurate information provided about its author, date, place of publication, and original URL.